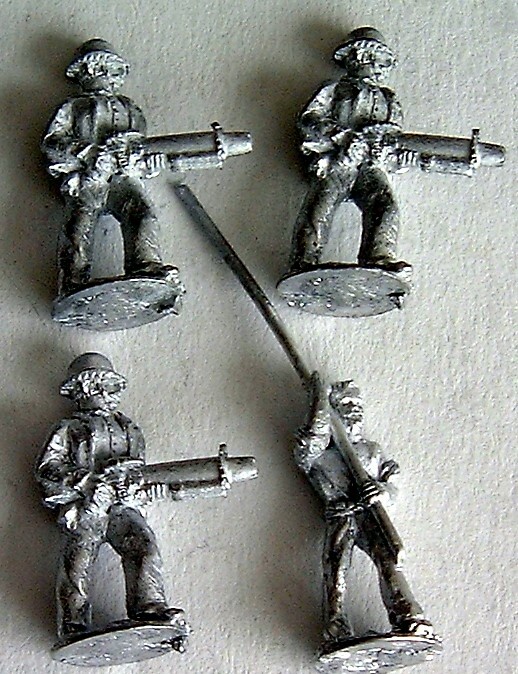 Now before I started painting my civilians I decided to add a little variation to them so after sanding off the top of all of their heads I added flat caps to one and all and beards to a couple of them as well. I also added a bit of extra length to a couple of the jackets, turning them into Mackintosh raincoats, and I added a waistcoat to one of the standard bearers. Next I added the cross pieces to the top of my standard bearers poles using short lengths of cocktail stick, then after basing them on two pence pieces they too were strayed matt black along with the bobbies from last time. 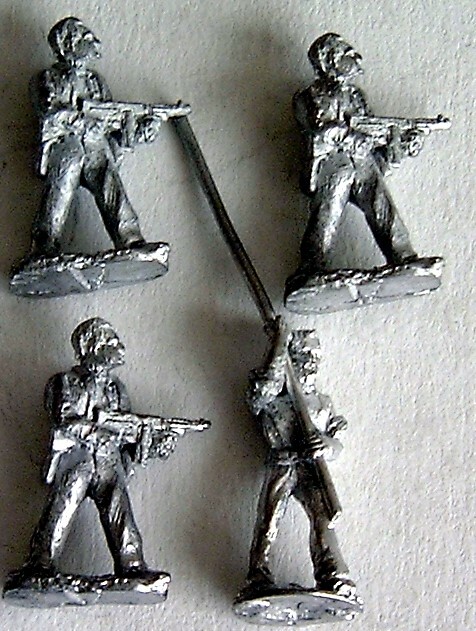 After the basecoat was applied they were all dry-brushed with chain mail over the guns. All of the suits were then undercoated and highlighted with either, dark grey and a touch of black, these areas were then highlighted with just dark grey, chocolate brown again with a touch of black and these areas were of course highlighted with chocolate brown, or just dark grey highlighted with dark grey and white making (surprise, surprise) a light grey. The only additions to these were the chap in the brown raincoat on which butternut was used as an undercoat, and a mix of this and coffee was used to highlight it and the chap sporting the blazer which was undercoated in a mix of black and royal blue with just royal blue highlights. Flesh next, Flesh tone seven was used this time as the base colour to add a little more variation over the previous batches and after the eyes were added, I highlighted them in European flesh. I then added the highlights to their boots, so out came the leather brown and dark grey to do this. Hair came next couple of the figures hairlines were undercoated in sand and highlighted in lemon yellow and others were chocolate brown highlighted in chestnut, one more was given grey hair in dark grey and light grey. Shirts were either light blue and porcelain blue or coffee and cream. That just left the caps to be added in either chocolate brown or dark grey and highlighted in butternut or light grey and then the checks on the caps were done in butternut and coffee or very light grey. 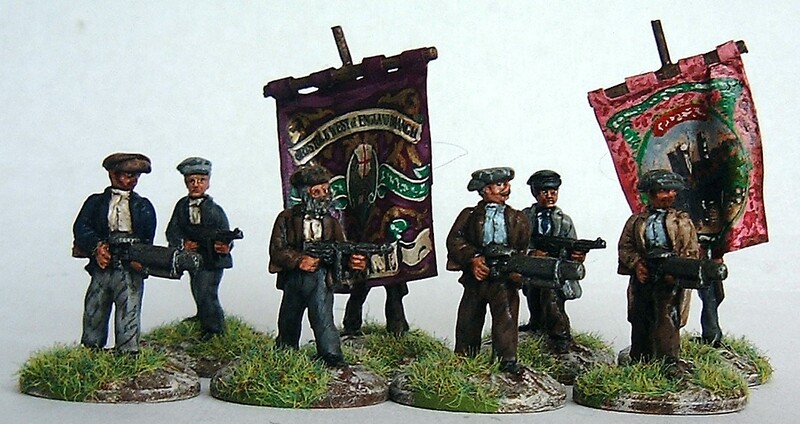 Now those of you who have been with me for a while may remember that I painted the banner on the last of my “standard bearers”, by printing out a picture of a trade union banner (after re-sizing it in my photo software) onto some paper and, cutting this out double length (e.g. with a plain back piece) with and extra piece in the middle for the “loops” that were marked and cut out in the middle. I then painted over the top of this (painting by number style), well that’s exactly what I did again this time, cheating…well a bit but I’m rather pleased with the results, Then I painted the backs to match, before cutting a diagonal line across the back piece so I could hook it around the pole, once glued in place with PVA I added the ripples to the flags,(these will stay in place once the glue sets), and used a little superglue to fix in to the back of their hands for extra security. I then touched up around the edges of the flags and where the two edges of the slice met at the back before all of the figures were given a coat of Quickshade strong tone, and then they (along with the coppers from last time) were based in my usual fashion. Lastly they had a final “blow over” with the matt varnish. And that’s it, fifty one civilians, forty policemen (and one policewoman), nine horses, one field gun, one heavy machine gun, four flags and three dogs later, I am just about done. Please don’t ask for a battle report as I have no rules or suitable scenery to go with them. So what am I going to do with them now they are finished…well I really don’t know I hadn’t thought this far ahead, at the moment I am toying with the idea of putting them on a “bring and buy” at a future show to help finance a future project (without the Border collies of course, they will be staying with me! ), I’ll see how the mood takes me at the time. But for now I’ll leave you with the long overdue group shots I been promising for “oh so long now”. Till next week, I’ll stop now as it’s time for tea and cheers Roger. This entry was posted in A very British civil war and tagged VBCW. Bookmark the permalink. Many thanks Simon, I’ll have a think and E-mail you back later. Eee, bah gum! It’s t’ Ecky Thump Brigade! If you’re a fan of “The Goodies” you’ll get the reference, and I’m sure you will. Sorry, Roger, it was the flat caps that made me think of that. The group shots are simply wonderful. Thanks for sharing. Sorry if you didn’t understand that, I’m from the north, and even I’m not sure what it says! Great work my friend. Always a nice feeling to get something completed. Thanks Impy, it certainly is, though I’ve still got plenty to keep me busy. Simply marvellous mate, I love the group shots! Seems a shame for them to languish around though but if they fund future buys then why not. Thanks Andy, haven’t decided yet what I’ll do with them, but I can’t see me investing all the time and money I’d need to spend on scenery to do this at a level I’d be happy with, so selling them on is a definite option. Thanks Roy, it actually felt like there was more of them while I was painting them! Nice work, tremendous project. Appreciate your sharing and truly enjoyed reading about them and seeing the final results. Well done, congrats! Many thanks Mark, I hope you enjoy my new project as much. What a great way to say goodbye to an old friend! Fabulous group photos at the end too. many thanks Michael, pastures new as they say. Glad you liked the group shots. Lovely, although I’m saddened that you won’t be fielding them. I’ve been living vicariously through your posts.